Not too long ago, CBC Newsworld, an all-news, all-the-time television network - kind of like Canada's answer to CNN - went through a significant re-branding exercise. It emerged from this exercise with the name CBC News Network (duh) and it replaced all it's serious and sonorous and middle-aged male announcing staff with young, perky, perfectly coiffed and brightly dressed females. They also implemented short catchy musical stingers and equally brief visual bumpers to transition viewers from one article or segment to another. Making the transition complete was a big bright studio awash in soft hues of red and blue. Well, the transition was almost complete. The coup de grace was the removal of all the chairs in the studio. That's right. 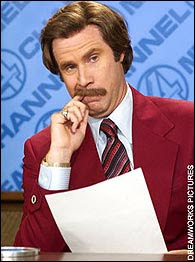 The anchormen, er, ah, make that women, would now stand to deliver the news. Alas the changes, to many, turned what once was a staid and dependable source for a traditional approach to journalism into more of an Entertainment Tonight or MTV approach to the news. Some liked the change. Some didn't. Regardless, all saw it for what it was: an attempt to attract a younger viewer with a fuller wallet. This would entice advertisers to spend more to air their commercials on the public broadcaster. Ah, yes, CBC News Network is publicly funded, not unlike PBS in the States. If I'm supposed to be gettin' down, gettin' it on or gettin' jiggy with the news, then why am I feeling so damn old? I'm watching the news in double-ply comfort! Ok, so maybe that didn't lure in the younger viewers, but don't you feel just a little peppier as you walk down the road to death? I like the updated look. But think they could go a step further and advertise new "Trojan" products with ribs and stop with the "viagra" ads too. That's just it. Most of these products are for people who have mobility problems. That's what I'm well on my way towards? Yep, Viagra's another one. I think they're going for a rise in their viewership. Heh, heh. How do you know about CBC News Network? Do you get them on satellite or something? Yup. Either that or I'm psychic. Or maybe it's psycho. Is the CBC News Network not paying attention to how well the cute younger female anchors have worked out in the US? Katie Couric couldn't get the ratings up after five years of trying and is being replaced by Scott Pelley. Diane Sawyer is holding her own but still trailing Brian Williams on NBC. Diane is 65 years old so she wasn't meant necessarily to target younger viewers. Thanks, Cheryl. That really cheered me up. 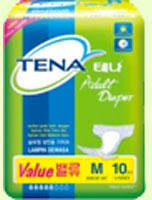 Wanna go half with me on July's supply of Depends? So what are you saying? I have years to go yet as a dirty old man? Boy I'll bet he single-handidly keeps Viagra in business. Well not single-handidly exactly, still with women. I think. We don't get CBCNN (?) here and the only Canadian channel we get is just regular old CBC. I do like, however, "The National" broadcast, not only for its national news but its international content as well. Oh, and Mansbridge's voice - so 'velveteen', like Lloyd Robertston's was. Personally, I don't think the younger demographic watches much televised news - they are too busy texting, Twitting or whatever so I doubt those 'old-timer' commercials aren't really hurting the Network. IF you think about it, they just remind you to pee before going to bed. Apparently, they forgot to replace the sales staff. Oops. Lloyd Robertson? He'll never attract a younger audience. He's the walking dead! The younger demographic is on Twitter and so on, yes, but also getting their news from such people as John Stewart and Stephen Colbert. Mansbridge was "discovered" when he announced flights in an airport in Northern Ontario. He's come a long way since then. Exactly. And they're all over 70! Ha! I think Melissa is onto the truth. Let me add: because people (not you) don't want to HAVE to age gracefully, they want to be like dumped Hugh Hefner surrounded by youth and beauty so they can fool themselves that they still gots it! AND... I'm not a senior and I have leakage problems. Is there an app for that? If depends were ribbed for my pleasure, I don't think I could wait to get in them. Seriously, advertising them with "pleasure nubs" might be a better way to haul in the younger viewers. There's little pleasurable in wetting myself. Nubs or no nubs. I don't think there's anything out there, really, that could enhance the experience of peeing my pants. Of course if they came with "magic fingers" that might be something else altogether. I hope you don't me the kind where you put quarters in the bed! I think I might quickly run out of quarters!